Zee’s is spearheaded by chef Marc Cuizon who also owns the whole Makan place. Chef Marc is very hands-on in the business. All these sumptuous dishes were prepared by him. Zee’s specializes in Filipino food. But it’s not just ordinary Pinoy food because chef Marc uses his magic in the kitchen to transform these dishes into a better version of it. They offer all-day Silog and Super Rice meals on weekdays, there’s the famous Lechon belly which is every Cebuanos favorite and All-You-Can eat offerings for only P288. Buffet is available on weekend lunches from 11AM – 2PM and weekend dinners from 5PM – 10PM. Chef Marc is a philanthropist in his own right, with numerous contribution to the needy in his own personal way. He reiterated that a portion of the sale from each food sold by the tenants in Makan will go to charity. Isn’t it heartwarming to know that while you are enjoying your food, a part of it is going to a benefit the less fortunate and goes to a better cause. What a great way to give back and help the needy. I hope more businessmen will do the same. Big ups to you chef Marc! If you are looking for a super tasty La Paz Batchoy, head on to Cio’s in Makan Ahooy because they have the yummiest La Paz Batchoy in town. For only P65 on the special batchoy (P55 for plain) it’s truly value for your money. They also serves grilled specials and other Asian hawker style food in their menu. I would recommend their Indonesian fried rice Nasi Goreng since it’s super tasty at P85. Cio’s definitely addresses the demand of good food at a very affordable price. Thank you Cio’s! Okay, okay. I am trying to keep myself together because I am about to introduce the most delish lasagna I’ve ever had. Their lasagna is sick! (in a good sick way of course). There is so much cream cheese on top that makes cheese lovers like me go crazy and I fell in love with their lasagna at first bite. Its flavor is set for the Pinoy taste buds since it is more into the sweet side. I got three words to describe Lasagne Que’s homegrown lasagna: Cheesy. DeliSweetcious. Awesome. Add/Follow Lasagne Que on Facebook to get the latest and updates real-time. What better way to heal a boring day other that a heart Korean food. Miga is the perfect place for that quick Korean comfort food fix. I’m a big fan of Gimbap and Samgyeopsal and Miga has that and more at a friendly price. Their resident cook for 30 years make sure that the food they serve is delicious and fresh. Head on to Makan Ahooy and meet have a taste of South Korean in one joint. The food didn’t disappoint me. Miga lived up to the standard of authentic Korean food, without hurting you pockets. Visit and Like their Facebook Page. Cebuanos love the famous pungko-pungko to bits. At Makan Ahooy, they have Mackies who has every popular street food that you know of plus more. Among their selections are Chinese Ngohiong (local kind of spring roll made up mainly of vegetables), Ginabot (Cebu’s version of chicharon bulaklak, made of deep fried pork intestines), siopao, siomai, different types of fried dumplings and other Chinese hawker food faves. With Mackies, you will enjoy all these without slouching while eating and of course with a much better (and cleaner) surroundings. If you’re hungry and need a quick fix, Lamoi kiosk has the answer for you. They also serve local favorites at a very reasonable prices. Students along the Lahug area are very fortunate because they’ve got Lamoi who serves affordable meals for people on a budget. Talk about major luck. Lamoi’s Melon juice is super good. I can drink that every day. Their food is home-grown goodness, literally anyone can like and appreciate. Craving for some Mediterranean food but on a budget? Head on to Jacob’s Shawarma and grab their Doner Rice meal combo or Shawarma choices that will satisfy your cravings. I like that their service is fast and the staff are friendly. You will never go wrong with Jacob’s. Visit them to try it yourself. See you there! 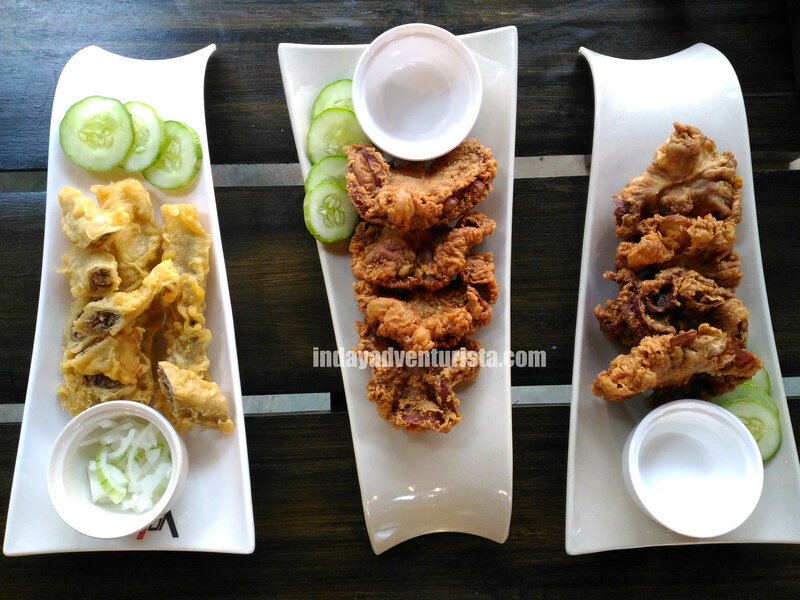 Cebuanos are known to be hearty eaters. When hunger calls, Makan Ahooy is the answer. Experience an overwhelming food feast all in one place. I, myself, is very happy that this concept was realized because it brought more options for foodies like us who are in dire need for an awesome gastronomic adventure. Ahooy! Zee’s an Lasagne Que are now at Sugbo Mercado I.T. Park. Don’t forget to drop by their stalls. Sugbo Mercado in Garden Block, I.T. Park is open on Thursdays through Saturdays from 4PM – 1AM.